Boson is a single-vineyard Ripasso produced from 5 hectares of fruit grown in the prestigious Illasi Valley. Vinified using the Valpolicella’s exclusive Ripasso technique, the fresh wine was refermented on the pomace of the Bosan Amarone. Full-bodied in style with a velvety finish, the bouquet is complex, layered with red cherry and spice aromas. Produced in limited quantities in only the finest vintages, this wine is aged 12 months in French oak barrels, followed by 6 months in large Slavonian oak barrels. A delightful treat. Bosan is regularly one of my favorite Ripasso wines. What sets it apart is the purity and the intensity of the bouquet. The style is bold and the oak tones are evident but well-folded within the greater texture of the wine. A wine of this intensity could pair with breaded veal chops or roast beef. From one of the estate’s four vineyard crus, the 2010 Valpolicella Ripasso Superiore Bosan is 80% Corvina and 20% Rondinella aged 12 months in French barrique and then transferred to botte grande for another six months. The wine beautifully illustrates the potential of Ripasso and consistently wins high marks across the board. Lush, rich and opulent, it delivers an exceedingly smooth mouthfeel supported by cherry, spice, leather, roasted almond, espresso and exotic aromas. Sweet spice and cinnamon appear on the close. This is a seductive soft and shapely red wine. Drink 2014-2024. Elegant and aromatic, featuring silky tannins wrapped around notes of plump cherry, ground anise, cassis, dark chocolate and exotic jasmine. Very harmonious, with a lasting finish. Drink now through 2020. Among the most consistently high-scoring Ripassos from Valpolicella, this is a lush, rich and modern rendition that’s tightly loaded with cherry, spice, leather, barbecue and tobacco flavors. The mouthfeel is smooth and round, with touches of sweet cinnamon on the finish. Try pairing it with osso buco. This shows lovely balance, as a floral note wafts through creamy flavors of black raspberry, currant, damson plum and star anise. This is silky and lightly spiced throughout, with a moderate, mineral-tinged finish. Drink now through 2017. Highly complex and forward bouquet featuring raisins, spices, medicinal herbs and dried fruit, all very open and expressive. On the palate the full fruity flavours are deliciously smooth and barely contrasted by tannins, which are surprisingly soft, whilst a little astringency defines the finish and aftertaste. Ripasso Bosan is a terrific wine, there’s no denying that. It offers intensity and aromatic complexity in the form of mature cherry, chocolate, pipe tobacco, cola and licorice. The mouthfeel is persistent and cleansing at the same time. Flavors of cherry, boysenberry and plum are lightly candied and appealing in this fresh, light-bodied red, which is framed by light tannins, with aromatic ground spices and tea rose notes on the finish. Drink now through 2014. Warm cherry jam, leafy, tart acidity, savoury but moderate tannins, with bright fruitiness. 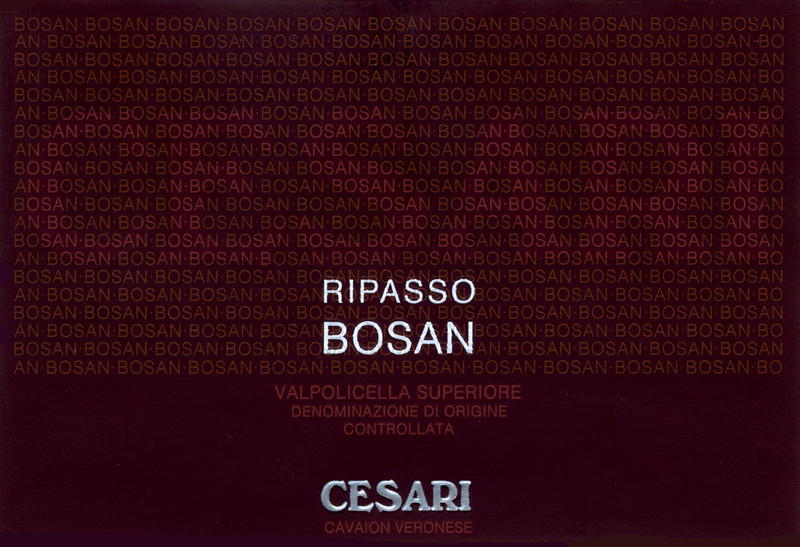 Cesari’s Bosan is among the top three Ripasso wines available in the US market. This beautifully crafted expression is rich and complex with lovely aromas of ripe cherry, blackberry, leather, mesquite, cola, roasted almond and sassy Indian spice. It shows density and long-lasting fruit flavors on the close. Ripe berry flavors of blueberry and blackberry play off of smoke, macerated plum, dark chocolate and herbes de provence notes in this fresh, well-balanced red. Light tannins show on the refined finish. Drink now through 2018. Vibrant, bright, spicy and black fruit aromas. Ripe cherry and red fruits, good balance, elegance and power. This concentrated wine offers aromas of tobacco leaf, stewed plum, grilled porcini mushroom and sage. The lush palate delivers blackberry extract layered with notes of chocolate and vanilla alongside velvety, embracing tannins. This is a lovely ripasso with a bright, modern personality and intense aromas of oak spice, red cherry, blackberry, mesquite and cola. There’s complexity and intrigue here and the wine could use another two or three years of bottle aging. Alternatively, it’s delicious to drink now. No doubt: this is a seductive, modern wine with opulent oak shadings that translate into chocolate fudge, spice and crème brûlée. Beyond the big oak tones are cherry fruit and Indian spice and the wine renders a very soft and round impression in the mouth.